Reach for your dreams with Disney Aspire — our brand new education investment program. We'll pay 100% of tuition up front for schools that are part of the Disney Aspire network! We’re investing in the futures of hourly employees and Cast Members with our new education investment program, Disney Aspire. 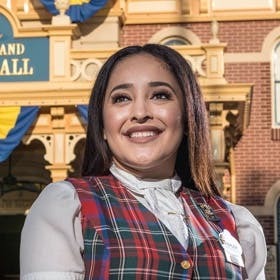 Through this program, we hope to foster passion through education, promote confidence, and help employees and Cast Members focus on what really matters — reaching their dreams. * US-based regular full-time and regular part-time hourly employees and Cast Members are eligible to participate in the program after 90 days of employment with Disney. Three quarters of the jobs added since the recession have gone to workers with a bachelor's degree or higher. Individuals with a college degree earn 66% more than someone without one over their lifetime. By 2028, there will be three million jobs available in skilled trades. Dreaming of a Disney career?